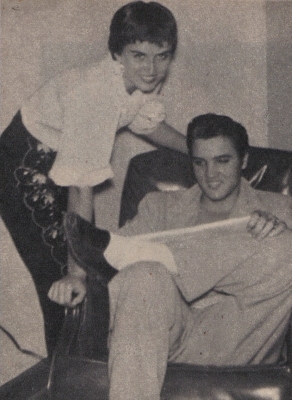 She shared a passionate, three-year relationship with Elvis at the start of his career, when was virtually unknown outside the southern United States. And June recalls a man far removed from the bloated, drug-addicted mega-star who died 16 years ago, on August 16, 1977. But it is another date that is forever etched into June’s memory – June 26, 1955. That was the she met Elvis and on that date 22 years later the King gave his last public performance. When Elvis spotted June coming out of the ladies’ room during intermission at one of his shows, she was a pretty, starry-eyed 17-year-old. “Well there isn’t much to see in Biloxi,” June countered. “I don’t care,” Elvis replied. “Just show me what there is.” Still dripping with perspiration after gyrating wildly on stage in what would become his trademark pelvis-thrusting style, Elvis picked June up in front of the theatre that night in his 1955 pink-and-white Ford Crown Victoria. “He said he wanted to change, so we drove to his motel and I waited in the car,” says June. “We took in some floor shows and then talked until daylight. At dawn Elvis kissed me for the first time…. It was the most memorable date I had with Elvis. We spent four-hour parked outside my house. He suggested we see the sun rise together, but I told him I’d have to go if my mother’s bedroom light came on.” “As dawn broke, Elvis kissed me, ever so gently. Then he poured out his heart to me and told me about his twin brother.” June says it was clear from that first date that Elvis had a deep love for his family. He told her how his mother had named his stillborn twin brother Jesse Garon because she didn’t want a grave that simply read Baby Boy Presley. But what struck June most about Elvis was how much he was amazed at his own success. “I could tell immediately that he was going to be big. He had this magnetic appeal about him,” recalls June. After their first date Elvis and June kept in close contact by phone for 5 months while he toured. Never much of a letter writer, Elvis did communicate by telegram. 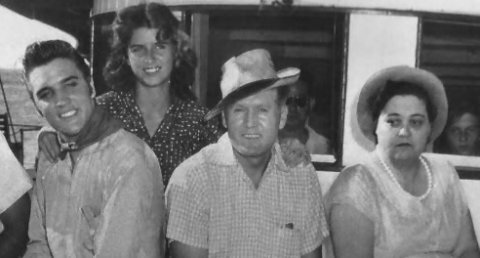 T he couple dated throughout 1956. Elvis would serenade June with the soulful ballad, IS IT SO STRANGE. “I loved that song,” recalls June. “So I asked Elvis to record it. just for me. The verse, ‘Is it so strange, I have no eyes for any other girl.’ still has a special meaning for me till this very day.” When Elvis recorded that song, he called the album, JUST FOR YOU. While Elvis and his ‘devil music’ were becoming the center of controversy, Hollywood was clamoring to get a piece of the action. “Elvis always talked about wanting to be in the movies,” says June. “He dreamed of becoming a serious actor like James Dean and Marlon Brando. He didn’t care to sing in the movies.” On April 1, 1956 Elvis did a screen test for Paramount Studios and was an instant star. He moved his family into a three-bedroom home he bought for $40,000 cash. Adding a swimming pool and bought his mother a pink Cadillac, Elvis called June from Hollywood. She could hear in his voice he wasn’t happy. “He just couldn’t be himself. He had to get up at 5 in the morning, and that was when he was used to going to bed,” says June. On one of his frequent returns to Memphis, Elvis invited June home to meet his parents. For two weeks she shared his life. Friends dropped by, and Gladys was always ready with a Southern-style meal. Elvis wanted to hire servants, but Gladys wouldn’t hear of it. “Gladys was happy as punch just to cook because Elvis had outfitted the kitchen with every conceivable appliance,” says June. “Elvis and his mother named me, Little Satnin.” Satnin was Gladys’ pet name for Elvis because, she said, his skin was smooth as satin. By a sad coincidence, June’s son Tony was born the day Gladys died of a heart-attack – August 14, 1958. “I was giving birth when I heard about Lovey’s death. Had Tony been a girl I would’ve named her Gladys Love in memory of Elvis’ mother,” says June. But it was more than a year earlier in March, 1957 that June made the most crucial decision of her life. “I couldn’t wait in the wings while Elvis got on with his career,” she says. “I said good-bye to Elvis because he broke his vow – he was supposed to be true to me. It just didn’t work out that way.” “There was no one in particular in his life then, but I knew Elvis was not being true to me. We parted friends,” says June. Elvis told June she would always be welcome in his home, but for the next six years she had no contact with him as she pieced her life back together. It was not until 1963 that June plucked up the courage to face Elvis again. Seeing Elvis in 1969, June never dreamed that a mere 8 years later Elvis Presley would become caricature of his former self. Tears spring to her eyes and her voice drops to a whisper as she remembers the day, 16 years ago, that Elvis died. “For years I couldn’t talk about Elvis. But now with all that ugly stuff being written about Elvis, I have the need to set the record straight,” says June. She is writing her story, IN THE TWILIGHT OF MEMORY. The title is from a line in THE PROPHET. “If in the twilight of memory we should meet once more. 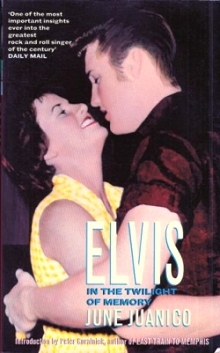 We shall speak again together and you shall sing to me a deeper song.” The book that June gave to Elvis in 1957 was found after his death, on his bedside table at Graceland. It is still there to this day.